In the mid fifties, amateur radio groups continued to play a significant role in the wireless industry. As many of their ranks became important pioneers in the early days, the younger enthusiasts continued to carry the torch and make their mark in the industry. In this decade, the nature of radio changed to suit the culture of the day as music tastes changed and television arrived on the scene. Rather than succumb to the new visual medium, radio reinvented itself more than once to remain relevant and competitive. 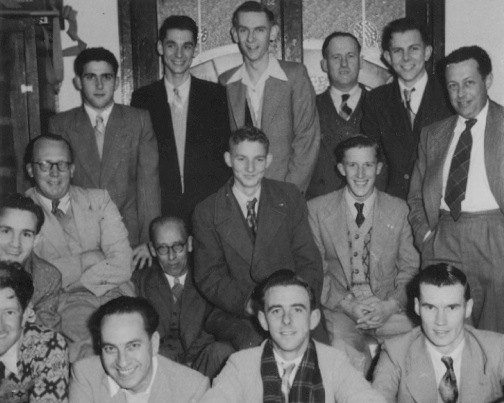 In 1955 the WA VHF (Amateur Radio) Group was formed as a result of the intransigence of the Wireless Institute of Australia, which classed the holders of limited licences (Z calls) as Associates of the WIA and refused them full membership. This group then went on to play a big role in the City of Melville establishing the Wireless Hill Telecommunications Museum in 1972. A number of the members went on to staff broadcasting stations in key positions. International Radio Regulations prescribe that radio operators who transmit must first demonstrate an adequate knowledge of the principles of electricity and wireless. An ability to send and receive Morse code was essential in the early years. The Post Master General’s Department required candidates to pass an examination in three sections. Electrical principles, radio principles and a practical component. A variety of exams were conducted. Amateur Operator’s Certificate of Proficiency (AOCP), Broadcast Operator’s Certificate of Proficiency (BOCP) and later the Television Operator’s Certificate of Proficiency (TVOCP). Amateurs and commercial station operators were required to possess the appropriate qualification, though for a time, the ABC conducted its own training department and internal examinations, which were the equivalent of the BOCP and TVOCP. 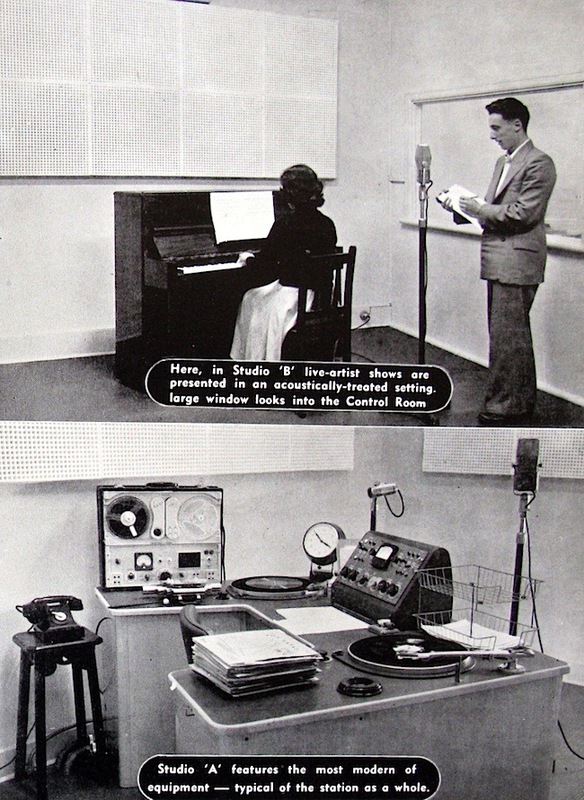 Eventually, broadcasting stations employed unqualified operators, who were then supervised by a qualified person. In more recent years, it got such that no qualified person was on the station or transmitter. Either an announcer operated alone with the transmitter unattended, to complete automation with everything under computer control. Much depended on the high reliability of modern equipment for this to evolve. In 1956, Albany’s first commercial radio station, 6VA was launched. Albany is located on Western Australia’s south coast, approximately 390 kilometres south east of Perth. The city was founded in 1827 – two years before Perth. Harry Atkinson established and managed 6VA. 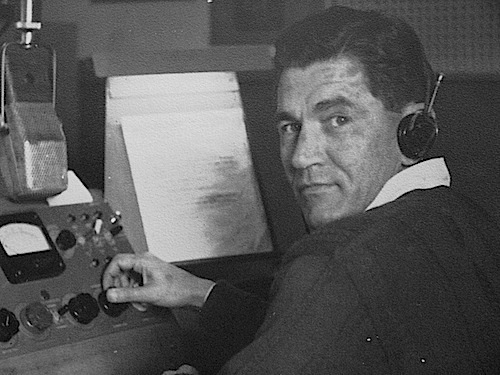 Born legally blind in 1913, Harry was first licensed as a radio amateur in 1937 and was an active ham (VK6WZ) until his death in 2001. He began as a roving reporter for the Wireless News before embarking on a career in country broadcasting. Harry became the editor of “Wireless News” in 1932, then “Wireless Weekly” in 1933 and a regular contributor to the “Broadcaster” magazine. In addition, to managing 6VA, he also managed 6WB, 6KG, and 6GE, and produced numerous programs for the ABC. Children’s Channel Seven personality Jim Atkinson got his broadcasting started at 6VA before moving to 6PR in Perth and then joining TVW Channel 7 in 1960. Radio broadcasting went through a dramatic transformation, starting with the introduction of American jukeboxes into milk bars and cafes where the teenagers gathered, leading to the phenomenon of jukebox ‘hits’ which was taken on board by the radio stations and evolved into the Top 40, as a response to the impact of television. Prior to the advent of Rock and Roll in the 1950s, the 1930s and 40s popular music was influenced by performers like Bing Crosby (1903–1977), Frank Sinatra (1915–1998) and Nat “King” Cole (1919–1965) as well as the earlier musical influences of Cole Porter (1891–1964), Irving Berlin (1888–1989), George Gershwin (1898–1937) and Ira Gershwin (1896–1983) and well-known American songwriting duos such as Richard Rogers (1902–1979) and Lorenz “Larry” Hart (1895–1943) and Richard Rogers and Oscar Hammerstein (1895–1960). Rock and Roll caused a revolution, and even though there have been many permutations, it still remains with us today. Invented in 1959, the NAB cartridge tape format made its widespread appearance in the 1960s and was designed for playing radio broadcasters commercials. The endless looped tapes could be loaded into the cartridges of varying lengths. The cartridge had a cue track to record stop and fast forward pulses to aid operational simplicity. It became ideal for playing jingles, promotions, news items or music. It revolutionised presentation techniques in the industry. In 1959, TVW Channel 7 opens, providing the first television service in Western Australia. Television brought vast changes to the radio industry. The radio serial dramas, variety and quiz shows, had less appeal to listeners now that they could watch them on TV. 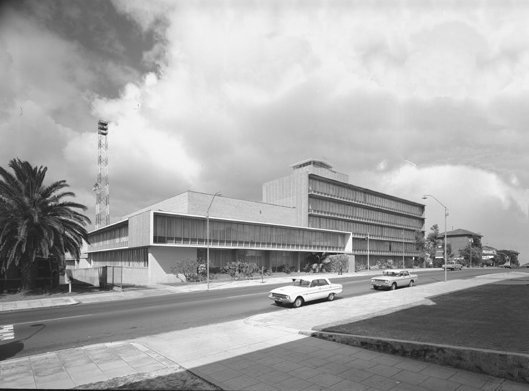 In 1960, ABC radio and the newly created ABC TV station ABW2 move to purpose built facilities in Adelaide Terrace, Perth. The AM band ABC regional stations have since grown to include 6AL Albany, 6BE Broome, 6BR Bridgetown, 6BS Busselton (Bunbury Studios), 6CA Carnarvon, 6DB Derby, 6DL Dalwallinu, 6ED Esperance, 6GN Geraldton, 6GF Kalgoorlie, 6KP Karratha, 6KW Kununurra, 6MJ Manjimup, 6MN Newman, 6PH Port Hedland, 6PN Pannawonica, 6PU Paraburdoo, 6TP Tom Price, 6WA Wagin, 6WH Wyndham and 6XM Exmouth. The stations then multiplied with the introduction of the ABC second regional network with FM stations carrying the Radio National programs. In addition, the satellite service carries ABC Regional Radio, Radio National, Classic FM and television. Later in Perth came 6PB News Radio. In 1960 two rhombic aerials were installed at the Applecross Wireless Station to provide communications associated with a NASA space mission. The NASA Echo satellite project happened in 1960, where the facilities were used for the NASA Space Mission communications, and the 120 metre mast was replaced with a shorter mast of 42 metres. in the same year Telstar was launched to develop satellite communications over the Atlantic Ocean. It successfully relayed through space the first television pictures, telephone calls, fax images and provided the first live transatlantic television feed. The first Top 40 television programs began soon after the medium started in Australia, coinciding with the first national TV rock’n’roll shows, Bandstand, Six O’Clock Rock, The Johnny O’Keefe Show, Sing Sing Sing, followed later by Go, Kommotion and Countdown. TVW produced Teen Beat, which was followed by Club 7 Teen and Pad 9 on STW. 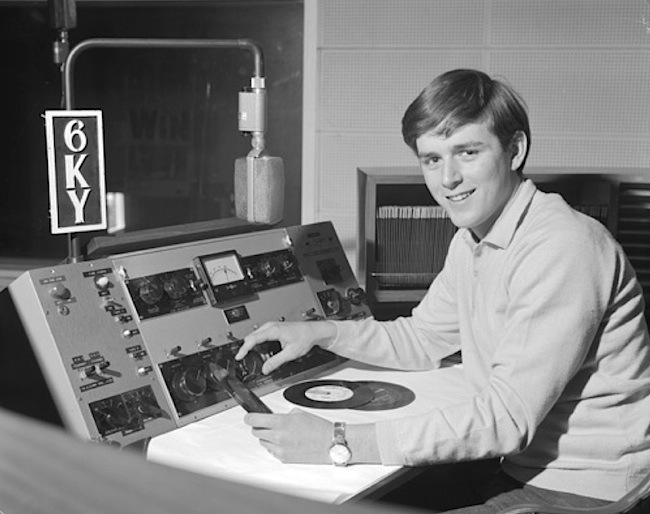 During the 1960s, 6PR, 6PM and 6KY were stations that compiled and publishing their own Top 40 charts, based on record sales obtained by ringing retail stores. The Totalisator Agency Board of Western Australia (operated by Racing and Wagering Western Australia since 2003) opened its first agency in Barrack Street, Perth in March 1961, which have now spread far and wide. 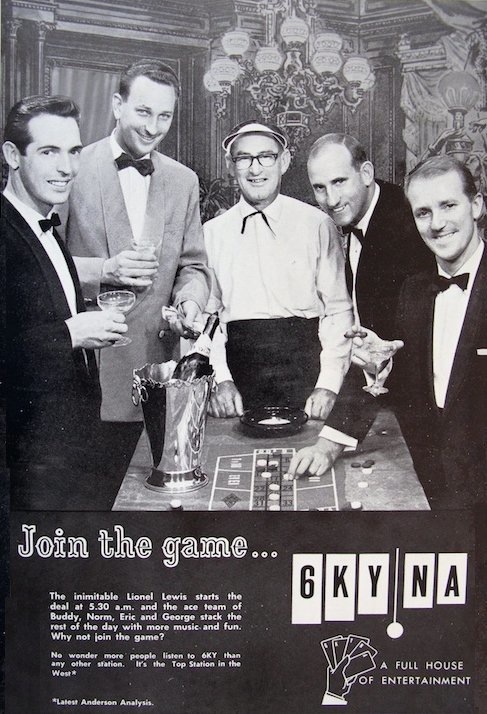 Following the 1959 Gambling Royal Commission, the WA TAB was established to replace the 206 licensed off-course betting shops, legal in Western Australia since 1958. Broadcasting of races became an integral part of the gaming business with official TAB radio stations in WA first being 6IX, then 6PR and now 6TAB (AM 1206). In 1963, NASA builds a tracking station at Carnarvon for the Gemini program, the second step for NASA to put a human on the Moon. 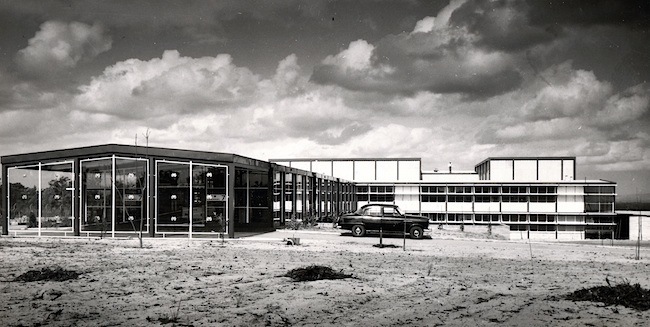 It replaced the Muchea Tracking Station (1960-1963) and used some of the equipment from Project Mercury (1959-1963). Muchea Communications Technician Gerry O’Connor became the first Australian to speak with a space traveller on 20 February 1962, when he called John Glenn aboard Friendship 7 on its pass over the West Australian coast, with Glenn acknowledging the lights of Perth. 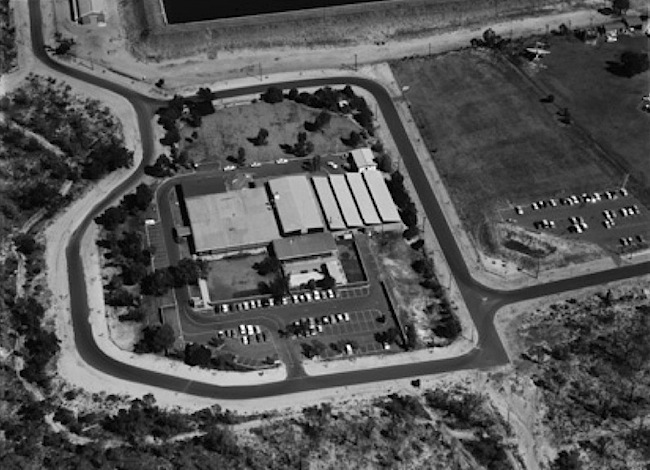 After the conclusion of the Gemini program (1965-1966), Carnarvon Tracking Station provided extensive support for the Project Apollo missions to the Moon. In mid 1963, the ABC began identifying each network by a number. The First Network (or Radio 1) was 6WF and all the other aligned ABC stations (2BL in Sydney, 3LO in Melbourne, 4QR in Brisbane, 5AN in Adelaide, 7ZR in Hobart, 2NC in Newcastle and 2CN in Canberra). The Second Network (or Radio 2) was 6WN and the related stations in the other states (2FC Sydney, 3AR Melbourne, 4QG Brisbane, 5CL Adelaide, 7ZL Hobart, 2NA Newcastle and 2CY Canberra), whilst the Third Network (Radio 3) was defined as the regionals. Because parliament was disrupting the schedule of serious programs on 6WF, it was decided to make its nature light and move the serious content to 6WN. The most powerful transmitter was required to carry federal parliament when it was sitting. In the late 1980s parliamentary was moved to its own frequency, which was originally the 6WN standby transmitter, and when parliament was not sitting it became a news network. 6PB provides this service for the Perth area. 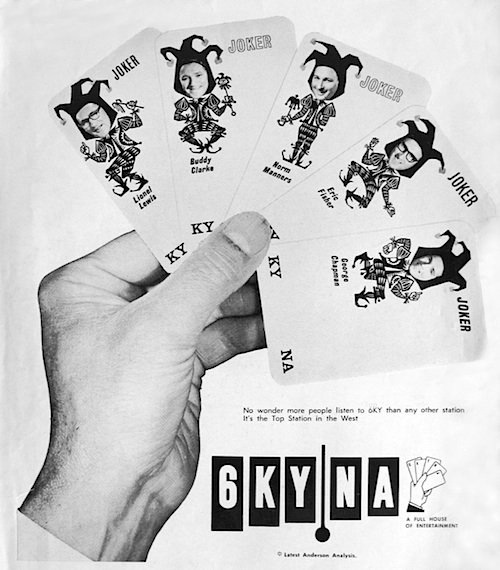 6IX became wholly owned by W.A. Newspapers in 1963 and Lloyd Lawson commenced a radio version of his Tuesday afternoon “Today” show once a week on the station, with Johnny Fryer making appearances. TVW newsreader Eric Walters started hosting the 6IX Saturday Night Show. The 6PR Good Guys (a US radio inspired format subsequently copied by Australian stations) made the Perth radio station number #1 in mid 1960’s, during the exciting days of 24-hour pop music and Top 40 radio. The Good Guys varied over time, though Garry Meadows, Keith McGowan, Graham Bowra, Eric Fisher, Peter Newman, Tom Payne, Keith Taylor, Bob O’Brien, Bill Rule and John McPhee come to mind. 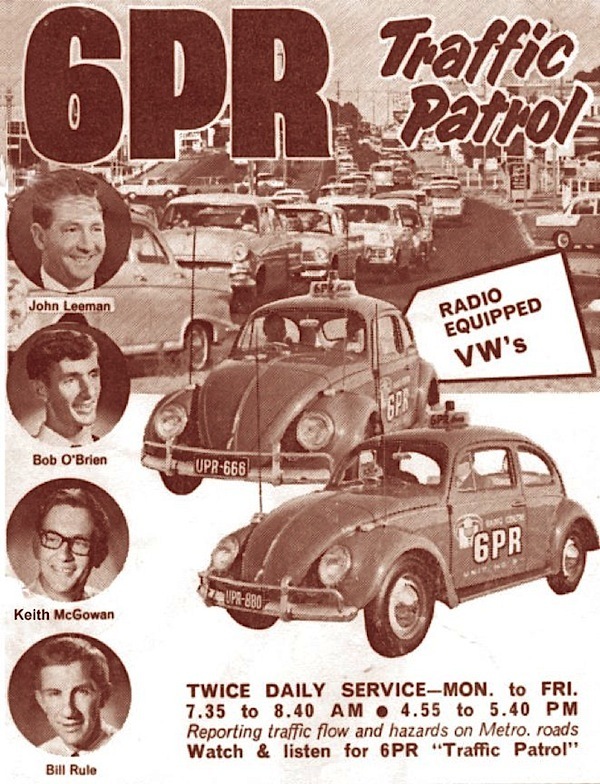 Added to this, Garry Meadows was the first in Perth to embrace Talkback Radio on 6PR in 1965, when it was a “fast, punchy and slick” station. Garry was a busy chap in those days working 4pm to 7pm on radio, hosting Bairds commercials on TV, hosting Spellbound and Miss West Coast on TVW Channel 7, and hosting the floorshows at the Nan King nightclub, late into the night. In 1965, STW Channel 9 in Perth begins transmissions. In 1966, the USA builds a Navel Communications Station at North West Cape, 6 kilometres (4 miles) north of the town of Exmouth.